Galactosemia is a genetic disorder that affects the body’s ability to process galactose, which is a simple sugar present in foods containing lactose. The most common type of galactosemia is also the most severe, and can result in liver damage, kidney failure, cataracts, and even brain damage. People with galactosemia can wear medical ID bracelets to alert rescuers, first-aid staff and other medical professionals of their condition, indicating appropriate action to during an emergency. 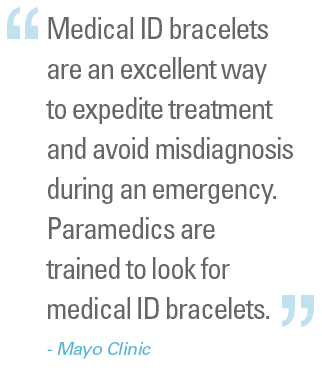 Medical ID bracelets can be the difference between life and death in for people with chronic conditions like galactosemia, since they require special medical care, and in some emergencies, may not be able to speak or communicate. The emergency may occur when a relative or a friend who has knowledge about the person's galactosemia may not be around. In these cases, a galactosemia bracelet can silently inform the attending medical personnel of the disease and need for specialized treatment. Galactosemia can be a tricky condition to have, primarily because lactose can be hidden in a variety of common foods. Some foods a person with galactosemia should avoid include milk, butter, cheese, cream, casein, sour cream, yogurt, margarine, and in some cases soy sauce and MSG. The Galactosemia Foundation recommends that all people with galactosemia wear a galactosemia medical alert identification bracelet, especially for children who may not be able to properly communicate their dietary restrictions. Always ensure that you or your loved one is wearing a galactosemia bracelet at all times, especially, before leaving the house. If necessary, pack an extra bracelet during special trips, particularly if you will be traveling alone or leaving town. Always wear the bracelet where it can be spotted easily and avoid taking it off. New styles and designs won’t cramp your style and it can mean the difference between living a healthy life and suffering major medical consequences.